Government of India has planned to scale up development of Grid-Connected Solar Power, under the National Solar Mission. 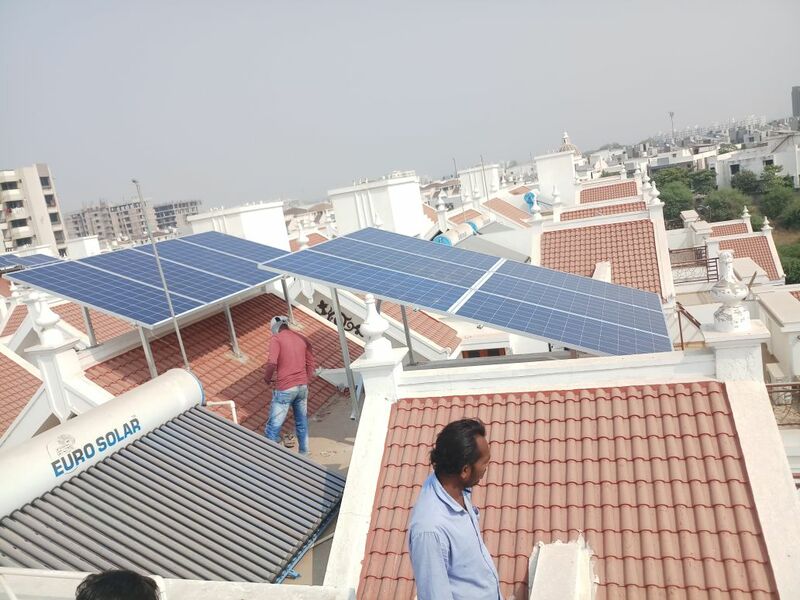 Government of Gujarat have declared scheme to promote the use of solar Energy by installation of Solar PV system on rooftop individual residences. 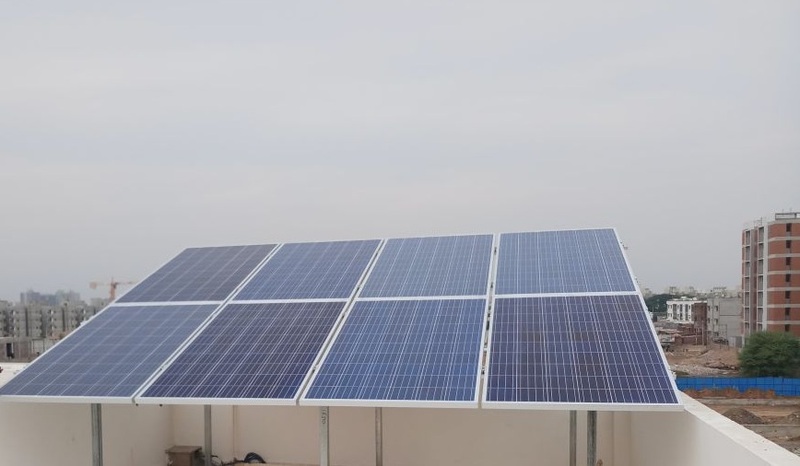 Installation of rooftop solar plant requires no land, and energy is consumed where it is generated; where would be no element of transmission loss or wheeling loss. Therefore, such plants would be in the interest of household saving as well as betterment of state utilities. Solar Power System is one of renewable energy systems which uses PV modules to convert sunlight into electricity. The electricity generated can be stored or used directly, fed back into grid line or combined with one or more other electricity generators or more renewable energy source. Solar PV system is very reliable and clean source of electricity that can suit a wide range of applications. Solar PV system generates electric power by converting solar radiation into electrical energy. 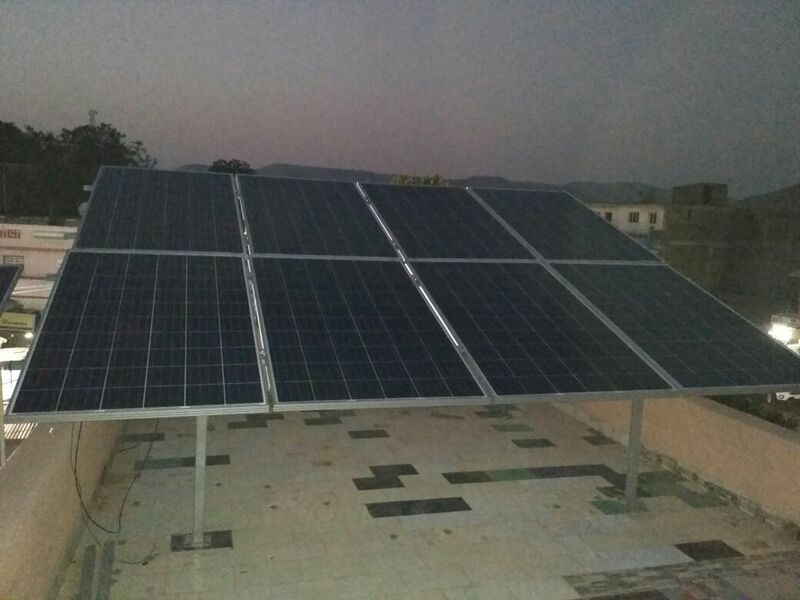 This consists of solar panels installed on roof top or on ground. Solar panels absorb the solar radiations and convert it to Direct Current Electricity. An inverter that is connected to the Solar Panels, converts the direct current electricity into alternate current. The electric power generated is fed into the utility grid (conventional or public grid). There is a simple meter accounting which directly meters the energy generated through the system before flowing into the grid. Photovoltaic system is very easy to install operate and maintain. Multiple Solar panels connected together and foam a solar array. The Power Conditioning Unit (PCU) used in grid connects SPV systems consists of an Inverter and other electronics for MPPT, Synchronization and remote monitoring. The inverter is the most complicated part of the PV system. It has to act as the interface between the PV array and the Grid. It needs to trip if the frequency of voltage or current goes outside acceptable ranges. It is an automatically / manually operated electrical switch designed to protect an electrical circuit from damage caused by overload or short circuit. Its basic function is to detect a fault condition and by interrupting continuity, to immediately discontinue electrical flow. 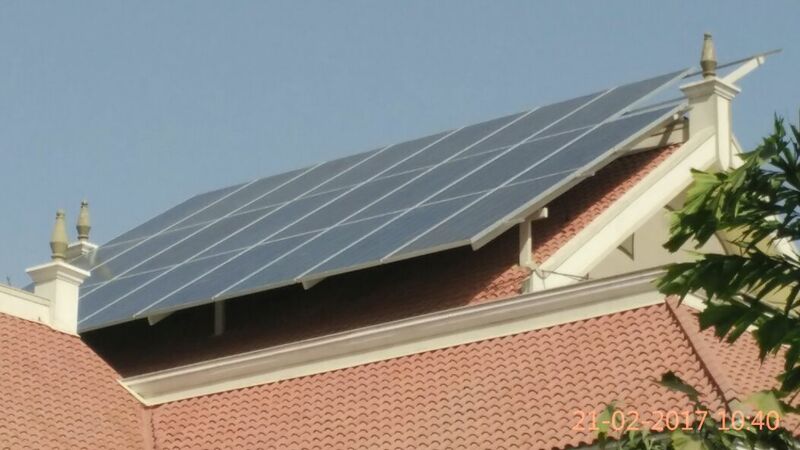 In case of rooftop solar PV systems, the metering system is of net metering and focus would be on consumption within the rooftop owners installations (with the grid acting as an energy bank). In such case existing utility meter is to be replaced by Bi-directional (or import – export) meter. A 1 kW photovoltaic system would require about 10 sq. meters of shadow free rooftop area. Large photovoltaic systems would require proportionally more space to absorb more sunlight. Hence for example, a 5 kW system would require 50 sq. meters area. 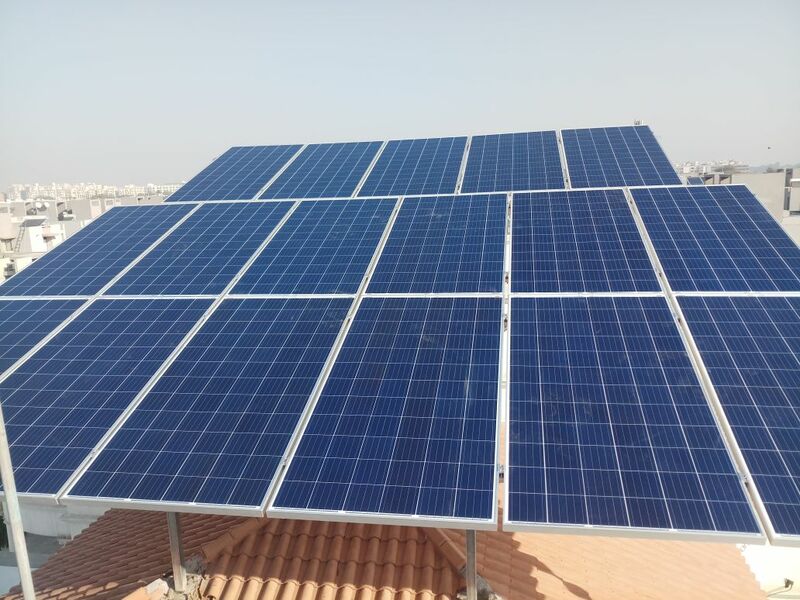 A 1 kW photovoltaic system would generate an average of 3-4 units (kWh) per day, 320 days are consider as sunny day in Gujarat State and hence 1 kW photovoltaic system would generate around 960 - 1280 units electricity per year. Surplus generation to be paid by DISCOM at APPC (Average poll purchase cost of the year of installation of system). Old Discovered price was Rs. 69,000/- per kW with 5 year CMC – Right Now Waiting for new Rate. Government of Gujarat provides Rs. 10,000/- per kW with maximum limit of Rs. 20,000/- as subsidy. Our Residential Solar Rooftop System are the easiest way for you to go to generate your own power. Our Solar Rooftop Systems are compact and efficient solar power packs, low budget with Government Subsidy, low maintenance, silent and pollution free. This Solar System comes with solar panel and inverter can give you power when it is most required. We are also help to Provide Mankind an Eco Friendly solution using the God's Graced SUN Energy. This renewable power option does not release greenhouses gases, carcinogens and CO2 like traditional fossil fuels. Our Social Sector Solar Rooftop System are the easiest way for you to go to generate your own power. Our Solar Rooftop Systems are compact and efficient solar power packs, low budget with Government Subsidy, low maintenance, silent and pollution free. This Solar System comes with solar panel and inverter can give you power when it is most required. We are also help to Provide Mankind an Eco Friendly solution using the God's Graced SUN Energy. This renewable power option does not release greenhouses gases, carcinogens and CO2 like traditional fossil fuels.